Pages are the static web pages that a website consists of, for example the page you are viewing now. Pages are listed on the left side of the website (with the standard theme enabled) in the navigation. All websites consist of pages. 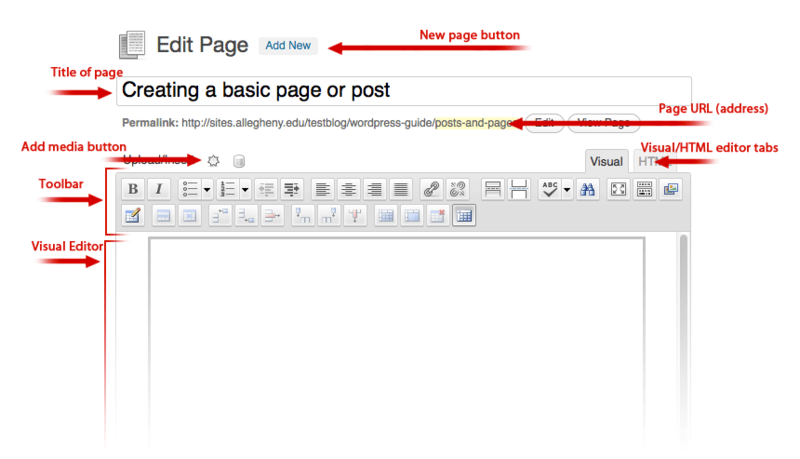 Some Allegheny websites have a blog page enabled, and in these examples, posts are what make up a blog feed (usually called News & Updates on Allegheny College website). A good example of posts in a blog is the department News & Updates pages or the Web News & Updates page. 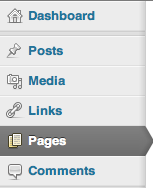 To create a new page, click on the Pages button on the Dashboard. The next screen will display a list of pages that already exist for the site, and general information (author, creation date, etc.) about each page. Since we are not looking to edit pages, but to create a new page, you’ll want to click on the “Add New” button on the top of the screen. To begin, you’ll need to add a title to the top of the page. Afterwards, you can start adding content to the page in the visual editor window. It is recommended to always do your work from inside this visual editor, rather than from an external editor, like Word. Most of the text formatting features are straight forward, so don’t be afraid to be explore. For a more in-depth look at text editing, be sure to check out the formatting text page. Images can sometimes make a website more interesting and, fortunately, WordPress makes it very easy to add images, and other media, to your pages. In order to upload media, click on the “Add Media” button above the toolbar. From here, you can upload your files located on your computer. Media files accepted include image files, movie files, sound files, PDFs, document files, and excel files. After the file is uploaded, click insert into post, and you’re done. Note: there are more steps and information that are important when uploading images that can be found in the images page. WordPress auto-saves periodically, but before you exit your work, you should always do a save yourself. 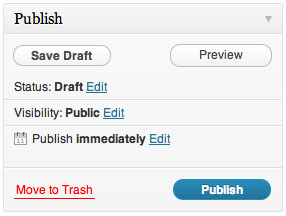 In order to initiate a save, in the publish window to the right, click on the “save draft” button. To view saved drafts later, go back to the list of pages. Your file will be labeled as a draft. Remember, the visual editor is only a representation of what the final page will look like. In order to preview your changes, and to get an idea of what the final product will look like, there is a preview button. Note that the preview button will not work unless you have finished your first “save draft”. Finally, when your page is finished and ready to be seen by the world, click on the publish button. Important: once a page is published, anyone will be able to view the webpage. Be sure and preview all changes before publishing. You have just finished your first webpage or post!